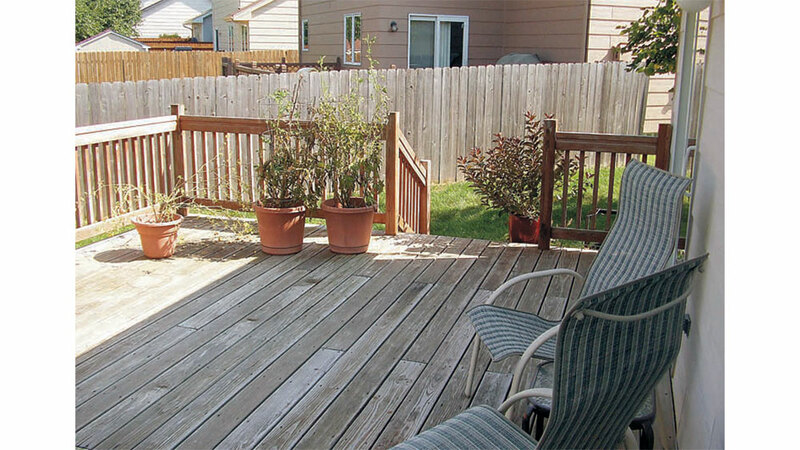 This deck was in need of an update, but it wasn't anything we couldn't handle on our own. Follow this advice and you can update your deck too. The size and shape of this deck were fine, it just needed an update. So we took off the old railing, cleaned the surface and moved the steps. Finally, we freshened up the look with a privacy and shade structure and railing to match. Here’s how. Because this deck gets a lot of sun, it doesn’t have a lot of discoloration from mildew, but the boards are somewhat faded. 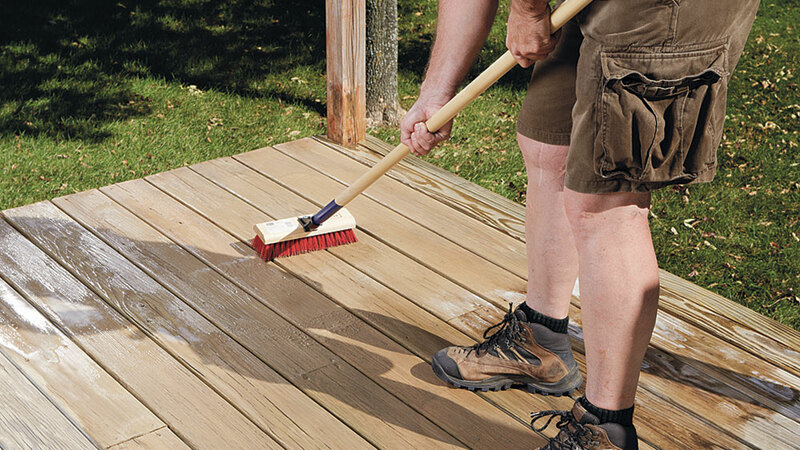 Here’s how to clean a deck. Most deck cleaners recommend that you follow up application by scrubbing with a stiff-bristled brush. As you scrub, you’ll notice a film of dirt starting to show up on the surface of the deck. After you’ve scrubbed the deck, it’s time to rinse. 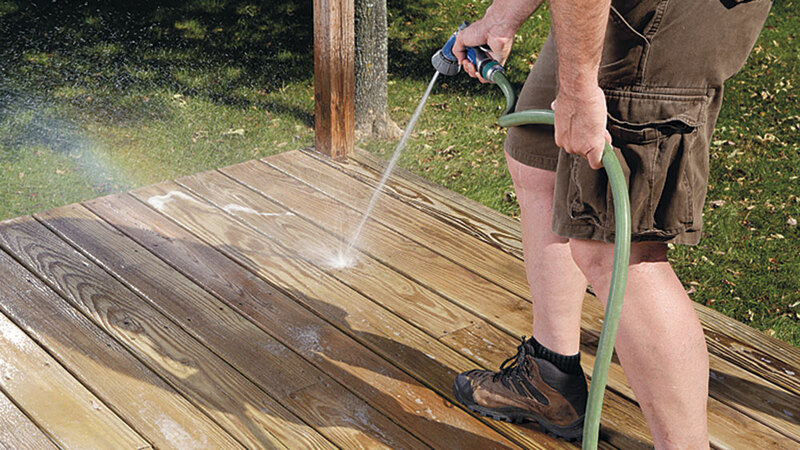 You can use a pressure washer (be sure not to gouge the wood with a powerful stream of water) but a hose with a sprayer nozzle works just fine, too. 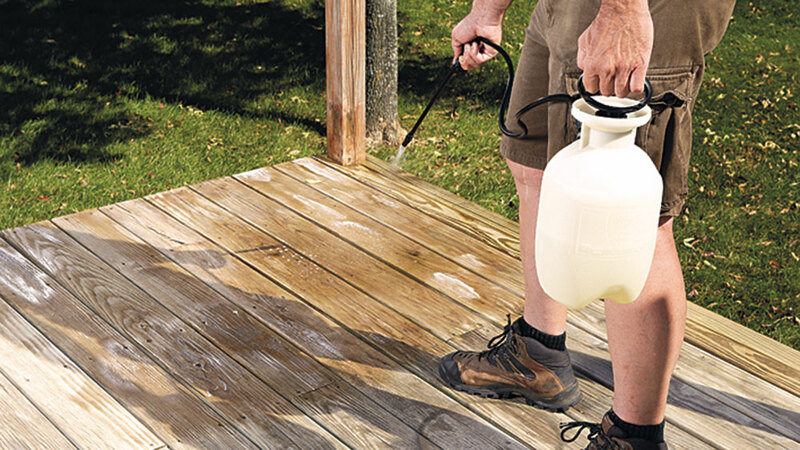 Most deck cleaners recommend that you saturate the area around the deck to dilute the solution so it can’t harm nearby plants. 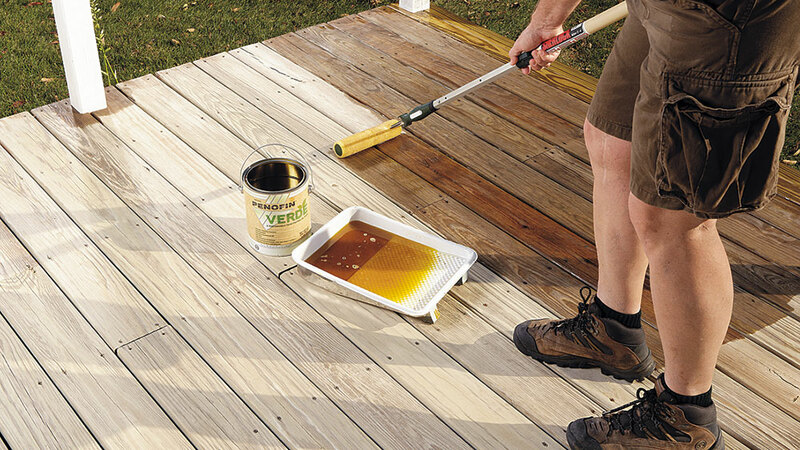 To protect the deck surface, we treated it with Penofin® Verde, an environmentally friendly oil treatment. We preferred not to change the color of the wood, so we used an untinted finish. You could use a tinted finish or stain if you want to change or enhance the color of your deck. Applying the oil with a roller was a quick way to cover a lot of surface. However, we did notice that it didn’t coat the sides of the boards, so we used a brush to do some touching up. After we applied a second coat of oil treatment and let it dry, we were ready to move on to the next step. The steps on this deck have moved around a lot! Originally, they were at the north end. Then the homeowner moved them to the south end, as you can see in the “before” photo, to make it easier to reach the hose. Unfortunately, that meant that the deck opened up directly in line with the neighbors’ back door, just where privacy would be most welcome. Since we wanted to install a privacy screen there, we moved the deck steps one last time, and here’s where they’ll stay! Relocating them to the center of the deck, opposite the house, leaves plenty of room for the privacy screen and directs your eye out into the back‑yard. It changes the traffic pattern through the deck area, but we’ll show you how we addressed that as you keep reading. The steps themselves got dressed up, too, with new treads, painted risers and new trim pieces on the side. 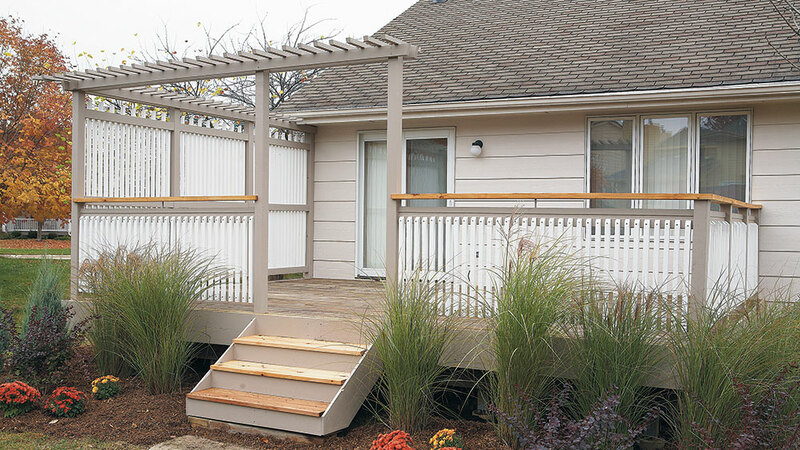 BEFORE: A mix of subtle details (the flush-mount lights and the refurbished deck steps) plus more dramatic changes, like the privacy screen, make this deck almost unrecognizable — in a good way! The original caps, railings and balusters were faded, warped and a little bit boring! When we took the railing down, we also took off the original balusters so we could reset and repaint everything. We painted the original rails and posts a soft taupe-gray, just a couple of shades darker than the house. Then we gave the balusters a crisp white coat of paint and reset them closer together than the originals for extra privacy. (This required some extra balusters.) Finally, we set a new unpainted cap on top of the old deck posts for some subtle drama. The finishes are all close in color but they show off some interesting new architectural details. With rails and balusters in place, we turned our attention to lighting. Lights make any outdoor area more pleasant after dark, and they’re also a safety feature, keeping you from tripping over unseen hazards. We installed small, flush-mounted LED puck lights, one on either side of each post. They cast a pleasant glow for after-dinner conversation, and give you enough light that you won’t go tripping down the steps after dark! 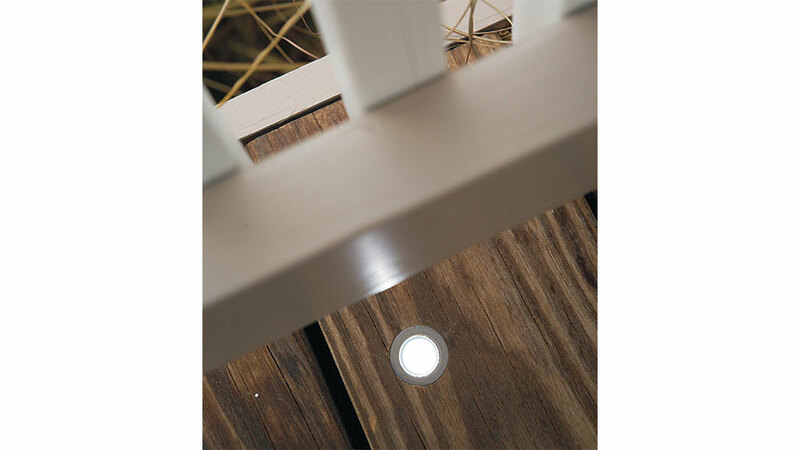 Positioning the flush-mount lights just on the inside of the deck railing creates a soft glow for your space. The biggest change to the deck was a new privacy screen on the south end. At this corner of the lot, the house is so close to the next door neighbor that you could almost see in the back door from the deck. No matter how much you like your neighbors, it’s nice not to feel like you’re on stage when you’re relaxing on the deck. The balusters on the screen are the same size and spacing as the lower ones around the other end of the deck. A rail at the top with short cross pieces gives the impression of overhead shelter, although it’s only 18 in. wide. We brought it around the corner to create a more dramatic entrance to the deck. The screen lets plenty of light and air through, and the homeowners can still wave to the neighbors. But when it’s time to enjoy the newly decorated deck you’ll see on the next page, there’s quite a bit more privacy.